History is going medieval. This week, the network released a new trailer and the premiere date for their upcoming TV show Knightfall. 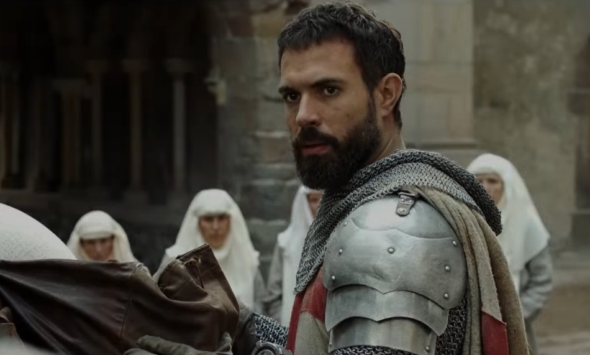 The historical drama “takes viewers inside the medieval politics and warfare of the Knights Templar, the most powerful, wealthy and mysterious military order of the Middle Ages who were entrusted with protecting Christianity’s most precious relics.” The cast includes Tom Cullen, Pádraic Delaney, and Jim Carter. Knightfall debuts on History on December 6th at 10 p.m. ET/PT. New York, NY – September 25, 2017 – HISTORY’s new drama series “Knightfall,” makes its series debut on Wednesday, December 6 at 10 PM ET/PT. From A+E Studios in association with Jeremy Renner’s The Combine and Midnight Radio, the ten episode season takes viewers inside the medieval politics and warfare of the Knights Templar, the most powerful, wealthy and mysterious military order of the Middle Ages who were entrusted with protecting Christianity’s most precious relics. “Knightfall” begins after the fall of the city of Acre, the Templar’s last stronghold in the Holy Land, where the Holy Grail is lost. Years later, a clue emerges suggesting the whereabouts of the Grail and sends the Templars, led by the noble, courageous and headstrong Templar Knight Landry (Tom Cullen, “Downton Abbey,” “Gunpowder”), on a life or death mission to find the lost Cup of Christ. From their battles in the Holy Land, to their clash with the King of France, to the dark events leading to the demise of the Templar Order on Friday the 13th, 1307 – a date which became synonymous with bad luck – the story of the Knights Templar has never been fully told until now. Focusing on themes such as belief, sacrifice, politics, love, power and revenge – “Knightfall” goes deep into the clandestine world of this legendary brotherhood of warrior monks to find out who these knights were, how they lived, and what they died believing. “Knightfall” joins HISTORY’s original scripted roster, which includes anchor hit series “Vikings,” renewed for a 20 episode sixth season; military drama “SIX,” currently in production on season two; and the recently announced series “Blue Book,” executive produced by Academy Award and Golden Globe(R) winner Robert Zemeckis, and “The Breach: Inside The Impeachment of Bill Clinton” from Emmy(R) Award winning producer R.J. Cutler. What do you think? Are you interested in the Knights Templar? Will you watch Knightfall?